Most computers on campus are small machines with USB ports located behind the monitors. There are usually 4 available to choose from. Some larger machines have USB ports on their front panels. You can access the flash drive by clicking the Windows File Explorer folder in the bottom task bar. In most cases the drive will show as Removable Drive (E: or F:) on campus depending on which port you use or if you renamed your USB drive. If the USB drive doesn't appear, remove it and reinsert it in a different USB port. To prevent loss of data, disable the drive before removing it from the port. Click on the small icon with the green arrow in the system tray (bottom right). Open Devices and Printers pop up window displays, click on Eject USB (you'll know which drive by E or F port) and a Safe to Remove Hardware message will pop up. You can safely remove your USB at this time. 4. 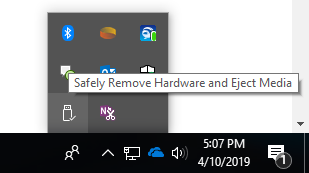 You can also safely remove your USB drive by right-clicking on it from the Windows File Explorer view and choosing Eject.